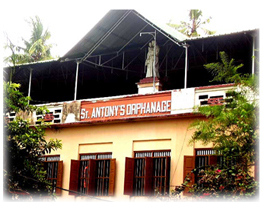 Welcome to St.Antony's Orphanage and thank you for the interest you are taking in us. We would like to share with you our little joys and sorrows and the unbounded gratitude for all those who make our lives happy and comfortable. The orphanage is located in Alappuzha, in Kerala state, India. As you can imagine, the expenses involved with running an orphanage can be enormous. The children need food, shelter, clothing and medical care. There are the expenses for the various supplies that are needed, such as school supplies, personal hygiene items, gardening supplies, and many other miscellaneous items required for the day-to-day operation of the orphanage. There are the costs involved for the much needed repairs and the expansion of the facilities and though it is only a meager wage, the staff must also be paid so that they may care for their own families. Of course we ask that you please offer a prayer for the children and all of Haiti and that others may come to share their prosperity with the children of Maison Fortuné Orphanage. If you or your group are interested in becoming involved with, or just learning more Orphanage, please feel free to contact us.